User blocked you or deleted the conversation with you. That error means that the recipient has closed your chat, or blocked you. It's a Facebook error, and not one that Front can bypass. Here is the error that Facebook provides. According to Facebook's developer page, the error message means 'Message Not Sent: This person isn't available right now.' This occurs when a user deletes a conversation. If you go directly to Facebook, you'll be able to reply to this recipient even if the conversation is deleted. The recipient will receive a request to create a new conversation with you. No error is generated. This is not the case when using a third-party service like Front. When you reply from Front we use the Facebook Front application that is linked to your page, so this error will occur if the recipient closes the chat or blocks you. "message": "(#100) No matching user found." Rodel Mangosing Are you asking what this error means? It most likely means the recipient blocked you or deleted the conversation they were having with you. Majd Ala Did either of you delete the conversation during the time you were chatting? Divyanshi Yadav How to resolve what exactly? Cori Morris I meant to resolve this issue. it's a frequent issue for me nowadays every now and then I am blocked by a friend and they don't even know how. what can I do in that situation? Divyanshi Yadav They are most likely closing out the chat. That will also result in this error. Trick Cuanan Shyu You can restore it by going into your Trash and clicking the trash icon. Where can i find the trash icon ?? Trick Cuanan Shyu It's the trash can at the top, next to the snooze clock. i dont see any trash can or snooze clock here, can you send a screenshot? (#100) No matching user found." 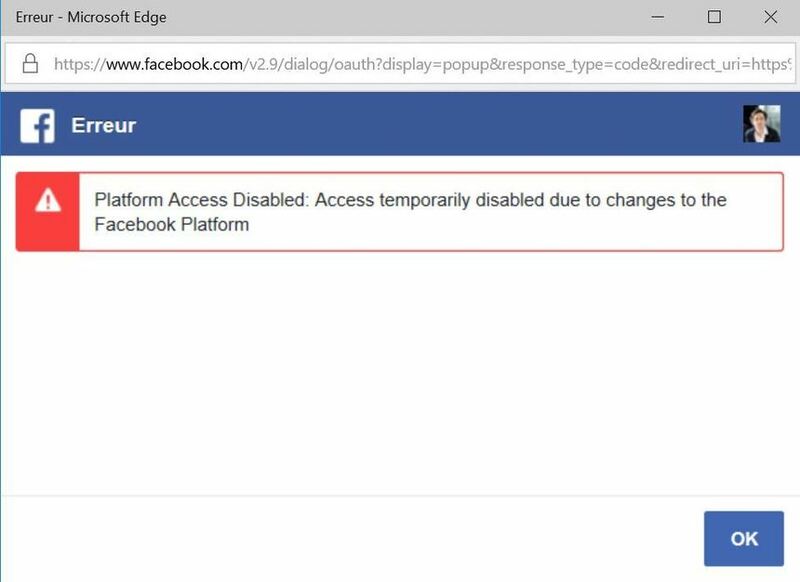 " Platform access disabled : access temporaly disabled due to changes to the Facebook Platform"
simon bocquet Facebook has posted a notice about this issue on their site, and some context about why we are experiencing it. I suggest subscribing to that to get updates from Facebook when it has been resolved. Hope that helps explain why you're having these issues. Trick Cuanan Shyu Sorry for the delay. Here's a screen shot. Sweety Rani More information about this error can be found above. Aaron Pollard What are you looking to do on the Messages tab? I want to add the Send message button so that my clients can message me on my business page.